Eight persons P, Q, R, S, T, U, V and W are sitting in a straight row while some of them are facing north and some of them are facing south. 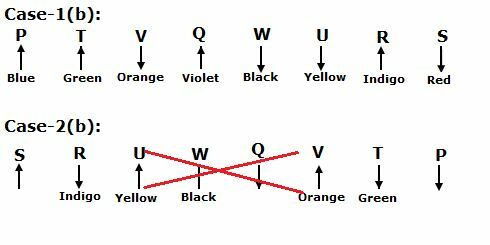 They all are like different colours namely Violet, Indigo, Blue, Green, Yellow, Orange, Red and Black but not necessary in the same order. Not more than two persons facing the same direction sitting together. The one who likes Indigo sits fourth to the left of V, who sits third from the either ends of the row. V and the one who likes Indigo are facing opposite directions.The one who likes Yellow sits second to the right of Q, who is an immediate neighbour of V. The immediate neighbours of V face the same direction. The one who likes Black sits third to the right of S, who sits one of the extreme ends of the row. Two persons are sitting between the one who likes Black and the one who likes Green, who does not sit at the extreme ends of the row. S does not like Green. As many persons sitting to the right of T is same as the persons sitting to the left of R. R neither likes Green nor likes Black. As many persons sitting between P and the one who likes Orange is same as between W and the one who likes Orange.Immediate neighbours of W faces the opposite directions. The persons sitting at the extreme ends of the row facing opposite direction to each other. The one who likes Blue and the one who likes Violet faces the same direction but not facing south. P does not like Violet. W faces the same direction as the one who likes Orange. 1. U likes which of the following colours? The one who likes Indigo sits fourth to the left of V, who sits third from the either ends of the row. V and the one who likes Indigo are facing opposite directions. The one who likes Yellow sits second to the right of Q, who is an immediate neighbour of V. The immediate neighbours of V face the same direction. The one who likes Black sits third to the right of S, who sits one of the extreme ends of the row. Two persons are sitting between the one who likes Black and the one who likes Green, who does not sit at the extreme ends of the row. S does not like Green. As many persons sitting to the right of T is same as the persons sitting to the left of R. R neither likes Green nor likes Black. As many persons sitting between P and the one who likes Orange is same as between W and the one who likes Orange. So, Case-1(a) and Case-2(a) will be dropped. Immediate neighbours of W faces the opposite directions. The persons sitting at the extreme ends of the row facing opposite direction to each other. The one who likes Blue and the one who likes Violet faces the same direction but not facing south. P does not like Violet. W faces the same direction as the one who likes Orange. 2. How many persons are sitting between Q and the one who likes Red? 3. 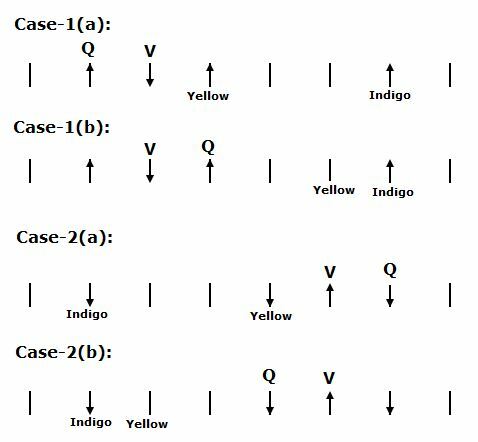 If V is related to Blue and W is related to Indigo in a certain way. Then, S is related to which of the following? 5. Four of the following five are alike in a certain way and hence form a group. Which one of the following that does not belong to the group? A word and number arrangement machine when given an input line of words and numbers rearranges them following a particular rule in each step. The following is an illustration of an input and rearrangement. 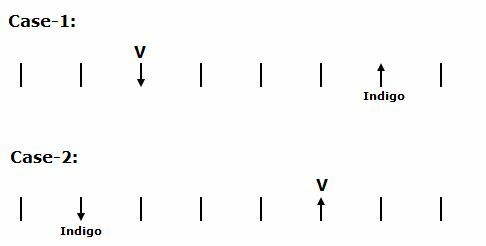 And Step V is the last step of the rearrangement of the above input. As per the rules followed in the above steps, find out in each of the following questions the appropriate step for the given input. 6. Which of the following elements will be the second to the right of fifth from the right end in Step IV? The words and numbers are taken alternatively in beginning and the last of the each step. The number are taken as the descending order and these are multiplied by starting with 1 and increased one by one in each step. The words are taken as descending order as per the English dictionary order. 7. In which step the elements ‘content eligible 24’ found in the same order? 8. Which of the following elements will be the fourth to the left of ‘eligible’ in Step II? 9. How many elements are there in between ‘68’ and ‘hearing’ in the last but one step? 10. If ‘39’ is related to ‘eligible’ in the Step II and ‘removed’ is related to ’84’ in the Step III in a certain way. Then, ‘hearing’ is related to which of the following in the last step? 1) U likes which of the following colours? 2) How many persons are sitting between Q and the one who likes Red? 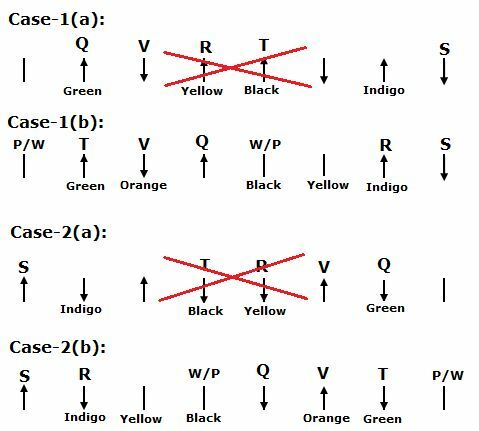 3) If V is related to Blue and W is related to Indigo in a certain way. Then, S is related to which of the following? 5) Four of the following five are alike in a certain way and hence form a group. Which one of the following that does not belong to the group? 6) Which of the following elements will be the second to the right of fifth from the right end in Step IV? 7) In which step the elements ‘content eligible 24’ found in the same order? 8) Which of the following elements will be the fourth to the left of ‘eligible’ in Step II? 9)How many elements are there in between ‘68’ and ‘hearing’ in the last but one step? 10) If ‘39’ is related to ‘eligible’ in the Step II and ‘removed’ is related to ’84’ in the Step III in a certain way. Then, ‘hearing’ is related to which of the following in the last step?